One of the most common health risks found in homes is exposure to mold and mildew. The effects of mold and mildew on human health are not fully known; however, like most everything, high concentration levels of any substance could potentially cause health risks. Mold and mildew cannot develop and grow without moisture. Moisture is also the easiest and most cost-effective component to control. 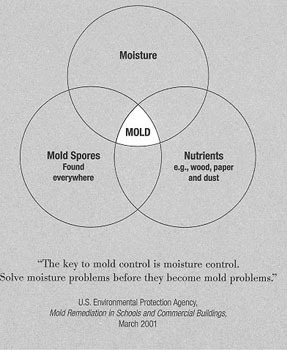 In addition to moisture, mold spores and nutrients must be available for mold to develop. Found everywhere, mold spores are common microscopic particles that easily become airborne and spread; they cannot be eliminated from most spaces without expensive cleanroom equipment. Nutrients provide food and are present in almost all building materials, as well as interior furnishings and even dust. Today’s tighter fabrication and fast-track scheduling of home construction, which can trap more moisture internally than ever before, could potentially lead to increased consumer complaints regarding moisture damage. This will continue to elevate the moisture content, mold and mildew issue as the general public becomes aware of both the health and financial risks associated with excessive moisture in the structure of their homes. In some cases, indoor mold growth may not be obvious. It is possible that mold may be growing on hidden surfaces, such as the back side of dry wall, wallpaper, or paneling, the top of ceiling tiles, the underside of carpets and pads, etc. Some building materials, such as dry wall with vinyl wallpaper over it or wood paneling, may act as vapor barriers trapping moisture underneath their surfaces and thereby providing a moist environment where mold can grow. You may suspect hidden mold if a building smells moldy, but you cannot see the source, or if you know there has been water damage and building occupants are reporting health problems. It's as old as the Earth and it's everywhere- inside homes and out. And under the right set of conditions, it can actually start to grow inside your house. Even though the issue of household mold is not new, you may have heard something about it recently in the media. The NAHB has prepared consumer information to help you understand what mold is, how it can grow in your home, the routine maintenance procedures you can follow to prevent mold problems, and methods of removing mold already in your home. http://www.moldtips.com - Information from the National Association of Home Builders (NAHB). http://www.wwpa.org/index_lumberandmold.htm - Excellent site from the Western Wood Products Association, which is based in Portland, OR. They have a commissioned study by a professor from Oregon State and an expert with a PhD from the University of Washington which is available online. http://www.aiha.org/news-pubs/newsroom/Documents/Facts about Mold.pdf - The American Industrial Hygiene Association has a good resource as well. http://www.onlinetips.org/instances-mold - General informatoin regarding mold.